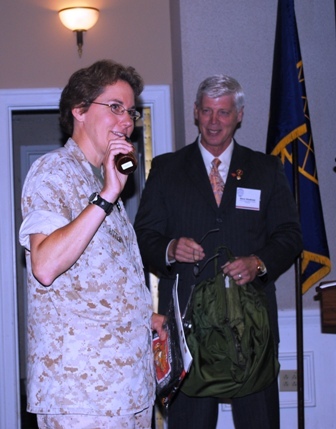 On Wednesday, July 13, 2011, the Commanding Officer of the Marine Corps Network Operations and Security Center, Col Laura Little, USMC, was our guest at the Clubs at Quantico for an Industry Mixer. She presented the current Network Operations and Defense posture of the Marine Corps and provided insight to emerging Cyber Operations. A copy of the brief can be downloaded here. Colonel Laura Little is a native of Endwell, New York. She graduated from the State University of New York at Potsdam in 1986 with a B.A. in Computer Science and was commissioned through Officer Candidates School in December 1986. Action Officer, Director’s Action Group, J6, Joint Staff, Washington, D.C. Colonel Little has attended Marine Corps Command and Staff College, Joint Air Command and Control Course, Amphibious Warfare School, Data Systems Officer Course, and The Basic School.